Marius Vachon, William Bouguereau, Paris, 1900, p. 154. When will the day come when I can do something worthy of a grown man? How many things must I yet learn before reaching that stage! In painting, I am an idealist. I see only the beautiful in art and, for me, art is the beautiful. Why reproduce what is ugly in nature? I do not see why it should be necessary. Painting what one sees just as it is, no-or at least, not unless one is immensely gifted. Talent is all-redeeming and can excuse anything. Nowadays, painters go much too far, just as writers and realist novelists do. There is no way of telling where they’ll draw the line. While his work may have fallen out of favor with many of the younger artists during the late nineteenth century, Bouguereau’s work and style of painting were nonetheless widely appreciated in France and also found great popularity in America during the nineteenth century. More recently, a re-evaluation of Bouguereau’s approach has led to a revived appreciation from a new audience. 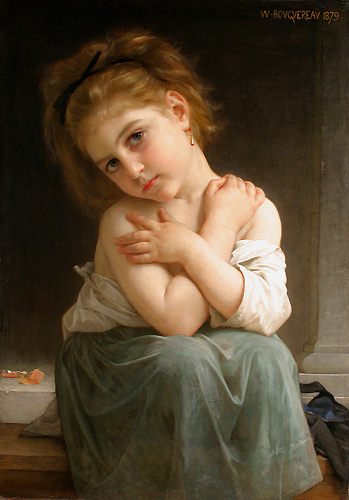 Bouguereau was born in La Rochelle on November 30, 1825, the second of four children. His father, Élie-Sulpice-Théodore Bouguereau was a wine merchant whose family descended from an old Huguenot family. His mother was Marie-Marguerite-Adeline Bonnin, of whom little is known. Several years after relocating to Saint-Martin de Re, Bouguereau boarded with his uncle Eugène Bouguereau in Pons who taught him Latin and instilled in him a great admiration for biblical writings and classical texts. Bouguereau began his artistic training in 1838, attending drawing lessons with Louis Sage, a former pupil of Jean-Dominique Ingres, a well-known neo-classical painter. His training was interrupted in 1841 after his father moved the family to Bordeaux and established a new business in the trade of olive oil. His father sent for his assistance, always hoping that his son would take over the family business, but both he and his father, much to his father’s disappointment, realized that Bouguereau was more interested in filling the ledgers with drawings than with paid receipts. After working another job with a wine merchant, Bouguereau earned enough money to enter the École Municipale de Dessin et de Peinture in Bordeaux, where Jean-Paul Alaux, after some persuasion, moved Bouguereau to the advanced class. So began the true artistic training of Bouguereau. He boarded again with his uncle, Eugène, who introduced him to many of his friends for whom he painted portraits during the next few months. After gaining enough money from commissions, he moved to Paris in March of 1846. He enrolled in courses under the celebrated Francois-Edouard Picot, who he then persuaded to recommend him for entry into the École des Beaux-Arts. Bouguereau just made the cut, placing ninety-ninth out of a hundred for entry into the École. Although relocating to Paris, he maintained strong ties with his birth city, La Rochelle, returning often when the École had vacation periods. This would be to his benefit as in 1848 the city of La Rochelle determined the importance of assisting Bouguereau in his continuation of artistic studies and provided him 500 francs, simply to encourage his continuation of artistic studies. This impeccable painting, in which everything is depicted with the utmost care, where the slightest detail is lovingly rendered, was not easily achieved. The material execution was confident and rapid, but the preparations were lengthy and carefully thought out, each subject being weighed and looked at every which way with the help of studies, full size cartoons, and numerous painted sketches Bouguereau was a constant perfectionist in his own work, often reworking the composition after it was technically complete. I live in Bouguereau’s studio, at the bottom of the garden; I don’t know whether you’ve ever seen it, its door is so well hidden behind laurels and boxwood. The bedroom is adjacent to it and I am quite alone in my retreat. Rats and the songs of nightbirds sometimes give me nightmares; but I become braver. At least, I am more daring than my predecessor, who couldn’t sleep without having a loaded gun at his bedside. During the next few years Bouguereau traveled extensively throughout the Italian cities and countryside, making many copies of works by great Italian masters. His stay in Italy lasted three years and four months, and upon his return to France he exhibited Le Triomphe du Martyr (The Triumph of the Martyr) at the Salon of 1854. He also took part in the Exposition Universelle of 1855 where he received a medal. Bouguereau’s popularity increased, as did the demand for larger commissions. In 1856 the state commissioned him to paint Napoleon III in Napoléon III Visitant les Inondés de Tarascon (Juin 1856) (Napoleon III Visiting the Flood Victims of Tarascon), his only true attempt at contemporary historical painting. He was also commissioned by religious organizations to provide decoration for their churches, such as his work for the chapel of St. Louis at the Sainte-Clothilde church in Paris (1859), and ceiling decorations for the chapels of St. Pierre-Paul and St. Jean-Baptiste at the St. Augustin Church in Paris (1867). In 1869 he painted decorations and the ceiling of the Salle des Concerts at the Grand Théâtre de Bordeaux. On January 8th, 1876 he was elected to the Académie des Beaux-Arts de l’Institut de France. Of this honor he wrote, “To become a member of the Institut…is the only public distinction I ever really wanted.” This great joy was overshadowed by the death of one of his sons and his wife, Nelly, who died in 1877. Shortly after her death he began a long courtship with one of the American students he met at the Académie Julian, Elizabeth Jane Gardner. They would not marry until after his mother’s death in 1896. During this period Bouguereau continued as a very active teacher at the Académie Julian where he was especially sought after by young women who valued his teaching experience and his ability to work with them in establishing professional artistic careers. After his battle with heart disease, William Bouguereau died in his home on the rue Verdière at La Rochelle during the night of August 19th, 1905. His career brought him from a more severe, historically based style influenced by classical texts and his period in Italy, to one that showed a freer expression of emotion focusing on Parisian scenes, children, and the essence of charity. Through his teachings and numerous Salon showings, he established a group of followers and gained recognition from many as a master of his trade. His last Salon entry was the year of his death when he exhibited L’Océanide (Ocean Nymph). The quotes in this biography have come from the primary source of information on William Bouguereau from the 1984 exhibition organized by the Montreal Museum of Fine Arts: William Bouguereau 1825-1905. Montreal Museum of Fine Arts: 1984. For further information on his teaching at the Académie Julian including photos, see Overcoming All Obstacles: The Women of the Académie Julian, Rutgers University Press: 1999.